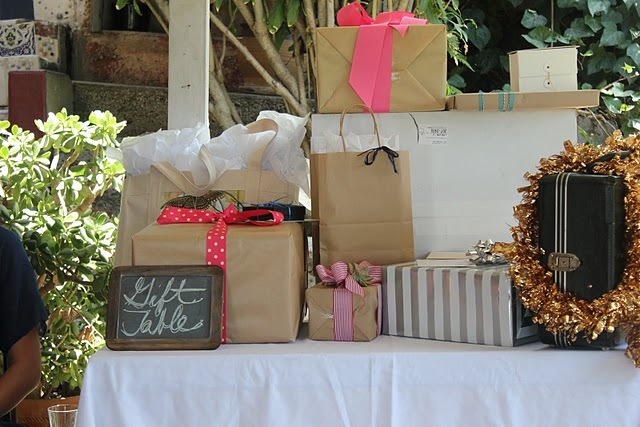 Hope you all enjoy this visual tour of the bridal shower I mentioned on Monday via Sarah’s pretty pretty pictures. The other hostesses and I wanted to honor our friend Anjali’s quirky-retro style and commitment to excellence in all things crafts, food and games. Oh, and make sure the shower felt hip and theme free. 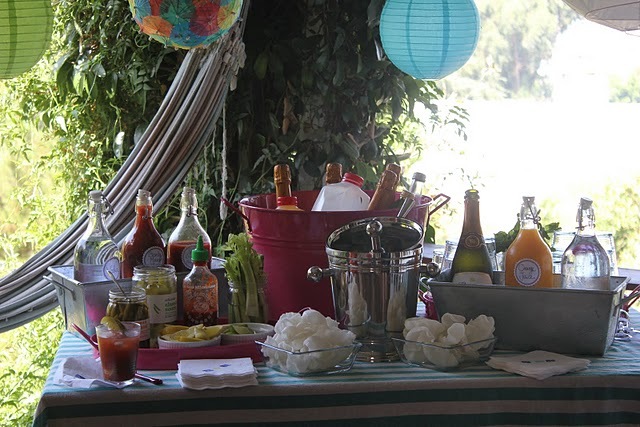 A big bar spread laid out on a Deck Towel draped table. You can’t ask guests to arrive at 11am on a Sunday morning and not offer a nice assortment of cocktails, right? 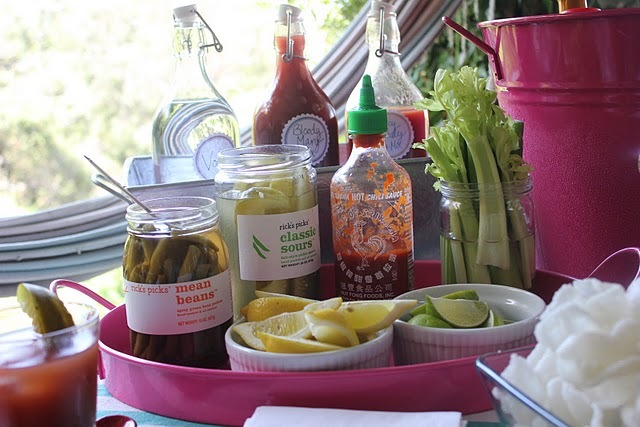 The Blood Mary Bar offered lots of mixers and vegetables to garnish, like spicy green beans, good pickles and sriracha to mix in for an extra kick. 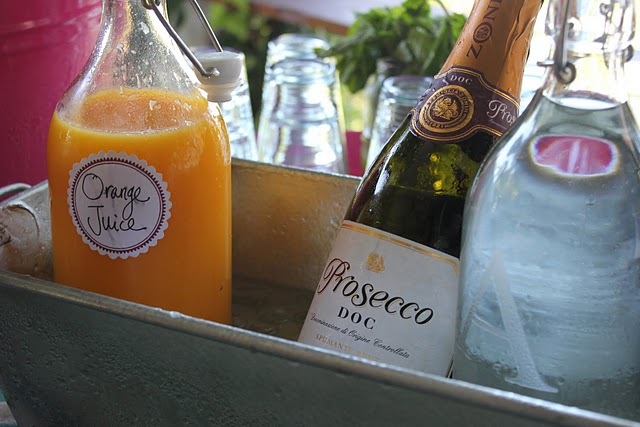 On the sweeter side there was Prosecco and fresh orange juice for mimosas. Creative gifts were tucked into craft paper and bright ribbons. The bride received vintage plates in her wedding colors, a coffee set from the 60’s and a stunning crystal punch bowl with many mini glasses for her holiday fetes. 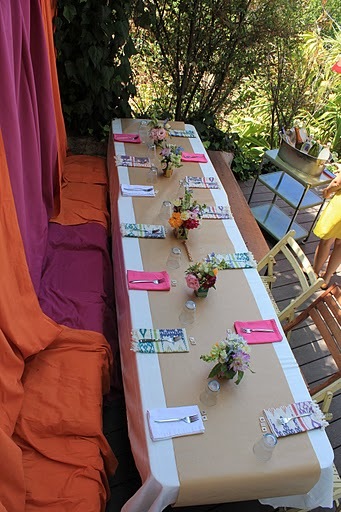 A long table with a craft paper runner was studded with bright linen napkins. The built in stone bench was covered with cushions and draped with saffron and magenta colored fabric from the balcony above. 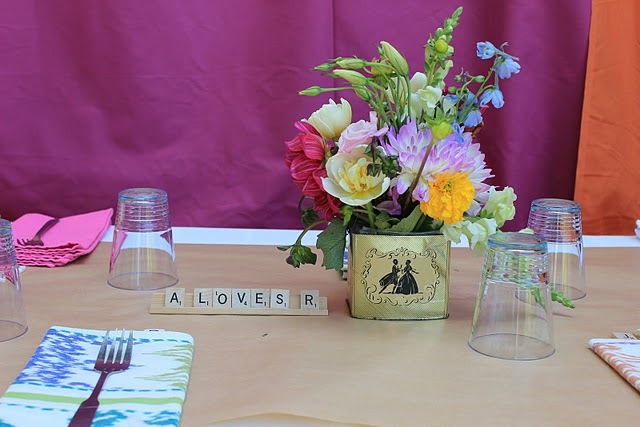 Beth artfully arranged multi-colored blooms from the farmer’s market in tiny tea tins. 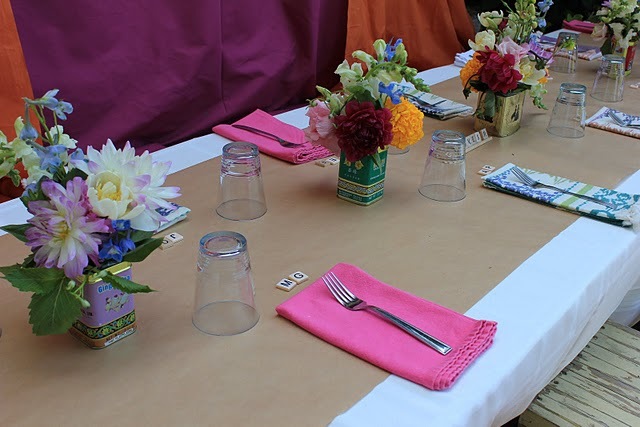 Each place setting on the table was marked by Scrabble letters of the guests initials. 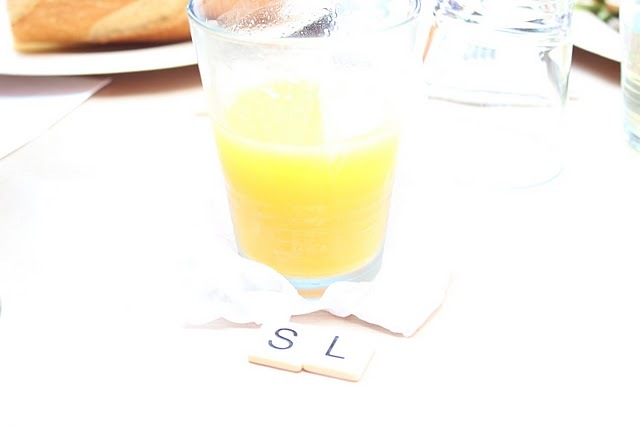 Orange juice in the mid-day light. 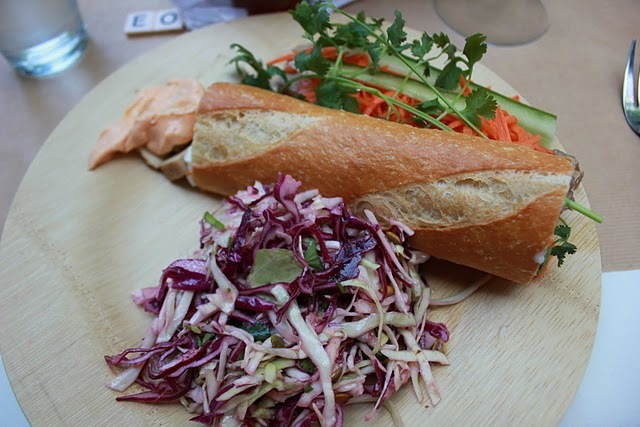 Each guest assembled their own Banh Mi sandwich from a buffet of items and served themselves cabbage salad on Bambu plates. 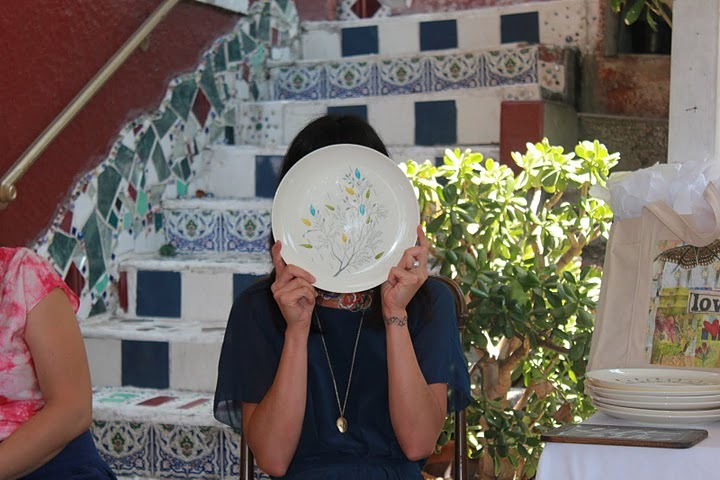 I struggled to get a good shot of my plate with editorial help from hostesses Niki and Sandra. 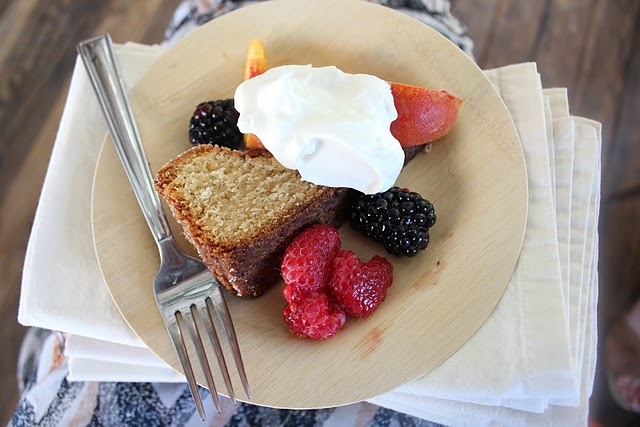 Elan made this incredible almond cake topped with fresh peaches, raspberries and blackberries and lemon whipped cream. We enjoyed it over the ohhs and ahhs of gift opening. SO many other crafts and details went into this event, I will share those in a post next week. Dude this is gorgeous. The scrabble letters are a great touch! I loved EVERYTHING. Thanks again for making me feel showered with love! 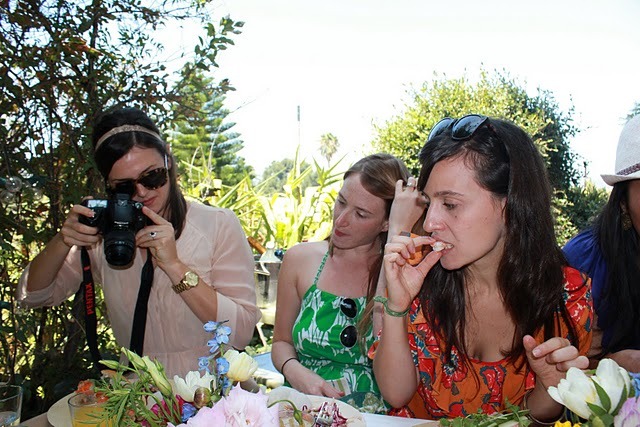 What a lovely wedding shower! The decor is so chic (the scrabble letters are so cool!) and the food looks delicious. Sigh. I heart it all. My mouth is watering just looking at the photos. Mmmmmm.